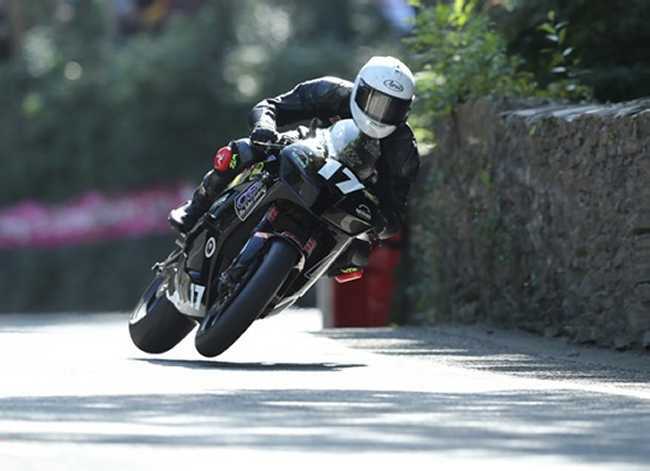 The Isle of Man’s Michael Evans, riding the Martin Bullock Motorsport Kawasaki, won a restarted Mylchreests Group Junior Manx Grand Prix on the Isle of Man today. With six of the top ten riders from last year’s corresponding race lining up, a close encounter for the podium places was expected for the podium places and so it proved. Evans got off to a flyer in the original race, breaking Malachi Mitchell-Thomas’s Junior MGP lap record with an opening lap of 121.066, establishing a ten second lead, before a red flag incident at Union Mills resulted in the race being stopped. The rider involved - Australian Royce Rowe - was taken by ambulance to Nobles Hospital with reported leg injuries where his condition was described as stable and not causing concern at this stage. The restarted race - which was reduced to three laps following the delay caused by clearing debris, oil and making a live street light which had fallen into the road safe - got underway at 12.10 and Andrew Farrell, a three time MGP podium finisher, was first away from the Glencrutchery Road start line. Tom Robinson, who was the eighth fastest qualifier but who retired at Glen Duff in the original race, was a non-starter while French rider Frederic Besnard, who slid off at Governors on his opening lap, was able to take part in the restarted race following a medical check. Farrell was first on the road at Glen Helen but was closely followed by Darren Cooper who moved into the lead 3.5 seconds ahead of Cooper. However Michael Evans, as he had done in the first race, came through from seventeenth on the grid to top the board at the first sector, three seconds ahead of Cooper. Charles Rhys Hardisty was 2.5 seconds back in third with Jamie Williams and Joe Faragher completing the top five. Fellow Manx rider Dean Osborne, the fastest qualifier, was sixth, less than a second behind Faragher. Brad Vicars, who won last night’s Newcomers A race was going well and moved up to fifth place at Ballaugh from seventh at Glen Helen, only 0.2 down from fourth placed man Williams but a significant gap was emerging at the front of the field with Michael Evans lead extended to almost ten seconds ahead of second placed man Darren Cooper. Pit stops were at the rider’s discretion on either lap 1 or lap 2 but Clerk of the Course advised competitors to be careful of approaching riders when exiting pit lane. Darren Cooper was first through the Grandstand with an opening lap of120.018 - which eventually placed him in second place - and elected to run straight through. Michael Evans came into the pits on the first lap after clocking a new lap record of 120.619 to lead the restarted race after his lap record in the first race was scrubbed from the books when the original race was stopped. Joe Faragher, who slotted into third place after his opening lap of 119.413, also chose to run through at the end of the first lap, while Williams (119.241) and Osborne (118.501) who completed the top five both pitted which meant that the true race position would only be revealed at Glen Helen on the third lap. At Glen Helen on the second lap, Cooper was the new race leader five seconds ahead of Joe Faragher, with Richard Charlton third a further eighteen seconds back. Michael Evans was now fourth, 33 seconds behind the race leader with Jamie Williams, twelve seconds down on Evans, completing the top five. With Cooper (119.487), Joe Faragher (118.390) and Charlton (116.804) all pitting at the end of the second lap, it was all change on the leader board and Charlton’s 30 second penalty for speeding in the pit lane dropped him even further down the timings. Evans regained the lead after his second lap of 118.390 and at Glen Helen he was 24 seconds ahead of Cooper with Jamie Williams, who clocked 115.798 on his second lap now in the final podium place. Barry Lee Evans and Dean Osborne completed the top five. Three riders – Michael Evans, Cooper and Glenn Harrison joined the prestigious ‘Tommy’ Club – named after former MGP winner Tommy Clucas – after posting their first 120mph+ laps while last night’s MGP Newcomer A race winner Brad Vicars was the first newcomer home in 9th place. All thirteen newcomers who started the race finished. Brendan Fargher was reported to be OK after sliding off at Windy Corner.